Credit: ESA/Hubble & NASA, S. Anderson et al. 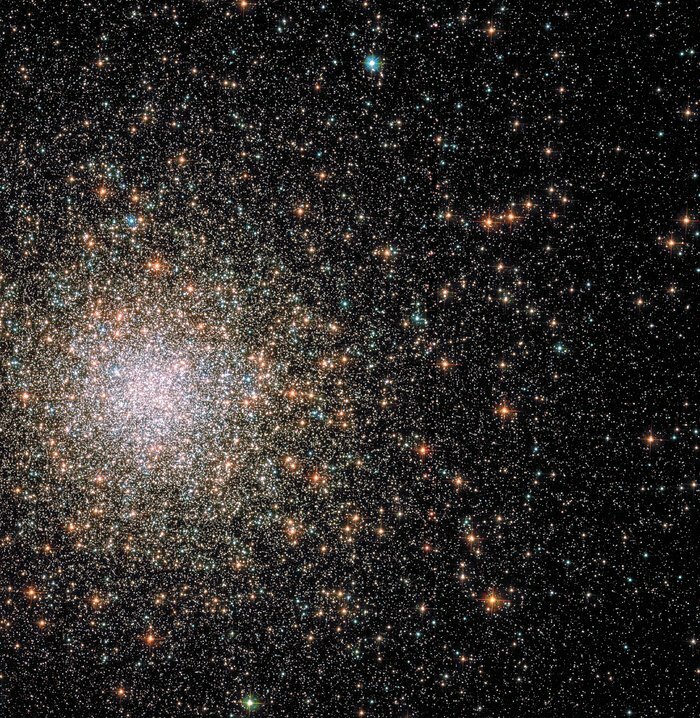 Most globular clusters are almost perfectly spherical collections of stars — but Messier 62 breaks the mould. The 12-billion-year-old cluster is distorted, and stretches out on one side to form a comet-like shape with a bright head and extended tail. As one of the closest globular clusters to the centre of our galaxy, Messier 62 is likely affected by strong tidal forces that displace many of its stars, resulting in this unusual shape. When globular clusters form, they tend to be somewhat denser towards the centre. The more massive the cluster, the denser the centre is likely to be. With a mass with almost a million times that of the Sun, Messier 62 is one of the densest of them all. With so many stars at the centre, interactions and mergers occur regularly. Huge stars form and run out of fuel quickly, exploding violently and their remains collapse to form white dwarfs, neutron stars and even black holes! For many years, it was believed that any black holes that form in a globular cluster would quickly be kicked out due to the violent interactions taking place there. However, in 2013, a black hole was discovered in Messier 62 — the first ever to be found in a Milky Way globular cluster, giving astronomers a whole new hunting ground for these mysterious objects. This view comprises ultraviolet and visible light gathered by the NASA/ESA Hubble Space Telescope’s Advanced Camera for Surveys. This area is near the emission nebula Sh2-264.